UDP Ukrainian Super Cup 2016/17. July 16, 2016. Odesa. Chornomorets stadium. Att: 26,109. 24 oC. The UDP Ukrainian Super Cup game was the official debut of Paulo Fonseca as the head coach of Shakhtar Donetsk. In its history, Shakhtar won the Ukrainian Super Cup seven times (including the last four consecutive wins), with Dynamo having two wins less. Donetsk played using the 4-4-2 formation. The pairing of central defenders was represented by Ivan Ordetsand Serhiy Kryvtsov, with Taison and Eduardo deployed as strikers. In the opening seconds, Eduardo was close to scoring one. The Croat won a challenge against Dragovic and entered the penalty area only to see his effort going wide. Later, the teams played cautiously, with really few dangerous chances emerging – all of them happened near Dynamo’s goal. 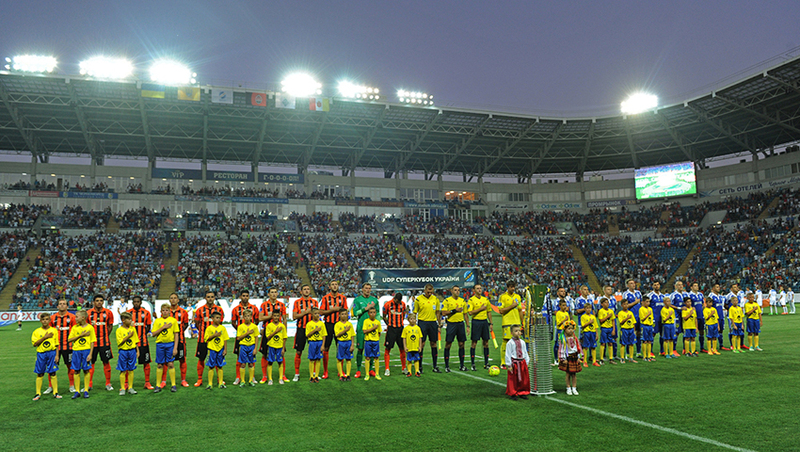 Midway through the first half, the Pitmen played a left-hand corner, with Bernard delivering it to the far corner of the goal area, where Darijo Srna fired a volley just inches off the far post.Taison received a cross from Bernard, beat three Dynamo players and fired it goalwards with his left foot, with Shovkovskyi stopping the ball just in front of himself and with Eduardo finally sending it home, but being caught offside by the ref. Just before the break, the same Taison and Eduardo tried their luck following a left-hand cross, but the Kyiv keeper and defenders stood just in the way. After the break, Dynamo got off to a more active start, still failing to create any goalscoring opportunities near the Donetsk goal. Only Gonzalez checked Pyatov’s reflexes with a long-ranger, with Andriy covering the ball at the near corner. While the Pitmen made the most of their chance. On 58 minutes, Fred received a pass from Marlos by the right corner of the penalty area, spectacularly made it past Antunes and cannoned it into the back of the net with his left foot – 1-0. Shakhtar immediately started pressing high upfield, making it difficult for Kyiv to enter the hosts’ half of the pitch. A long-range effort by Sydorchuk concealed certain threat though, with the ball whizzing by the crosspiece after taking deflection off a defender. On 80 minutes, Dynamo managed to equalise: after a right corner, Domagoj Vida won an aerial challenge in the Pitmen’s box and levelled it – 1-1. In the remaining minutes of normal time, the charges of Paulo Fonseca were closer to victory. FirstViktor Kovalenko hit the outside of the net from a tight angle first. And then Yevhen Seleznyov tried to send home a Fred pass, but missed the goal. 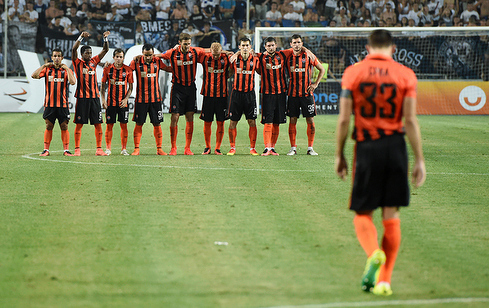 For the fifth time in the history of the Super Cup games between Shakhtar and Dynamo, the trophy’s future was decided in a penalty shoot-out. This time, lady luck shone on the Kyiv side. The shots by Bernard and Seleznyov went wide. As a result, 3-4. Now the Donetsk team are preparing for the start of the league season. 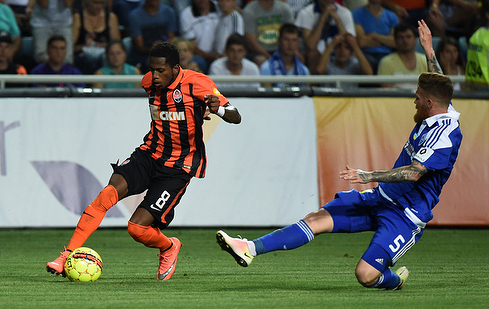 On July 22, in the first round of the Ukrainian Premier League, the team of Paulo Fonseca will meet with Zirka.